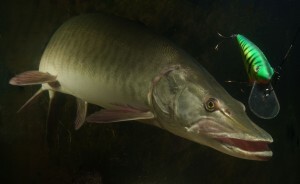 The muskie production program of the Department of Natural Resources (DNR) has turned a huge corner by stocking only Great Lakes muskies. DNRâ€™s Fish Production Section operates six large fish hatcheries, including the Wolf Lake State Fish Hatchery in Mattawan which the muskie program belongs to. Based on the departmentâ€™s figures, hatcheries produce 13 million trout and salmon and 30 million walleye, muskie and sturgeon annually. Thatâ€™s a total 600,000-700,000 pounds of fish a year stocked in the stateâ€™s public waters. Chris Barcelona knows goofy fish on Lake Michigan. Working years at ChicagoÃ¢â‚¬â„¢s water filtration plant will do that. But even he can be surprised. Say, by a white bass run on Lake Michigan off downtown Chicago. TRAVERSE CITY â€” Fish passage up Great Lakes river systems is a hotly contested topic. But meetings on the subject this week at the Hagerty Center seemed more like history and science lessons for the 80 to 100 people who attended. 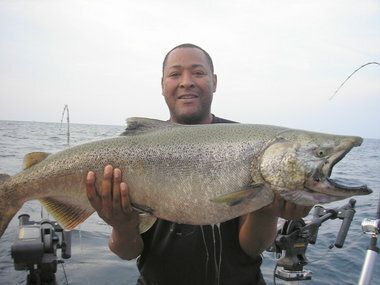 A first-time salmon fisherman caught one of the largest â€“ if not the largest â€“ Chinook salmon of the year Sunday morning while fishing from a Muskegon-based charter boat on Lake Michigan. Well, at least we got to see some nice salmon. Jonathan Dunn is a Chicago angler who trailers his vintage 23-foot Starcraft to Michigan a dozen times each summer to fish salmon, and I usually join him for three or four trips.